I have always been a fan of the RC Toy, and in fact I’m still a fan of a RC anything. This year for Christmas I received a RC helicopter with a digital video camera on it! I even have a remote control zombie thanks to my friend Rob and Thinkgeek. 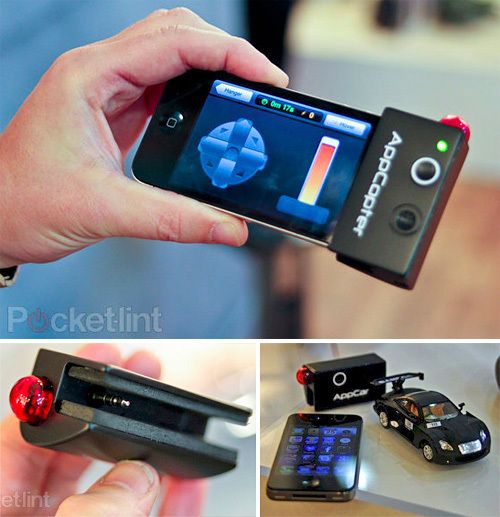 Well a little UK company, MediaSauce, is making a line of RC toys called AppToyz that can be controlled using your iphone or iPod Touch as the remote. The RC toys use an inexpensive RF dongle to communicate with the vehicle as well as a custom Remote application. The dongle actually plugs into the top of the phone using the headphone jack. This seems to be the standard for third party remotes. MediaSauce is going to come out with a RC Helicopter and Car and will be a bit more affordable than other iOS controllable RC Toys. The AppToyz helicopter will be around $80 and the car will be priced around $47 US.